Lock in a great price for Holiday Inn Express Hong Kong Kowloon CBD2 – rated 8.7 by recent guests! Room is spacious and clean. A bit far from the mid-town area but there are many restaurants and shopping arcades. Not far from MTR. The boom size is big compared to the others in hk. Staff really helpful and kind. The breakfast was good. The hotel is close to the subway station and APM mall. The location was very near to the mtr though the Holiday inn at Ashley road is even more close to the mtr . The place is new and clean as my expectation. Service is very nice and friendly. Clean and tidy hotel room is provided. Bathroom facility is good enough to meet my expectation. One soft and one hard pillow are also provided. Enough wall sockets are installed at the vicinity of bed and table. There was delicious breakfast, comfortable bed, clean toilet, and large view over city on window. Holiday Inn Express Hong Kong Kowloon CBD2 This rating is a reflection of how the property compares to the industry standard when it comes to price, facilities and services available. It's based on a self-evaluation by the property. Use this rating to help choose your stay! Conveniently located in Kwun Tong, Holiday Inn Express - Hong Kong Kowloon CBD2 is a 5-minute walk from Kwun Tong MTR Station. Within a walking distance of Hong Kong Kowloon CBD2, guests can easily reach Landmark East, Millennium City Complex and apm – one of the biggest shopping mall in East Kowloon. There are 286 restful guest rooms with high-speed WiFi, plush duvet and personal pick of pillows (soft or firm). Refreshing shower and complimentary buffet breakfast are also provided. Here at Hong Kong Kowloon CBD2, guests will find self-service facilities such as computers, laundry machines, dry-cleaning facilities and vending machines. 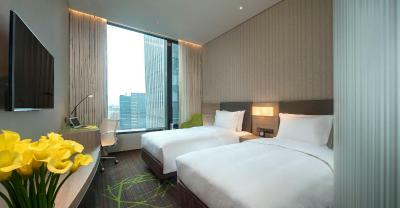 When would you like to stay at Holiday Inn Express Hong Kong Kowloon CBD2? The 20-square-yard room features free wifi, free buffet breakfast, audio system and 43 inch TV with international entertainment channels. Sleep in comfort with pillow choices. Work better on ergonomic chair. Ensure your privacy with international and reliable door lock system and branded in-room safe. The 20-square-yard room features free wifi, audio system, free buffet breakfast and 43 inch TV with international entertainment channels. Sleep in a comfortable king size bed with pillow choices. Work better on ergonomic chair. Ensure your privacy with international and reliable door lock system and branded in-room safe. Enjoy a spectacular city view on high floor with a 20-square-yard room. Room features free wifi and free buffet breakfast. Offering audio system, 43 inch LCD with international channels. Sleep in comfort with pillow choices. Ensure your privacy with international door lock system and branded in-room safe. Enjoy a spectacular city view on high floor with 20-square-yard room. It features free wifi, free buffet breakfast. Offering audio system, 43 inch LCD with international channels. Sleep in comfort with pillow choices. Ensure your privacy with international door lock system and branded in-room safe. Hotel surroundings – This neighborhood is a great choice for travelers interested in street food, local food and luxury brand shopping – Check location Good location – show map Guests loved walking around the neighborhood! House Rules Holiday Inn Express Hong Kong Kowloon CBD2 takes special requests – add in the next step! Holiday Inn Express Hong Kong Kowloon CBD2 accepts these cards and reserves the right to temporarily hold an amount prior to arrival. No pets are allowed except guide dogs or service animals. Individual credit cards are required for each room and the total amount of the room rate for the entire stay will be charged on the given credit card after reservation made. Card holder’s name must be the same as the guest name, otherwise the hotel reserve the right to cancel booking without further notice. Breakfast was only OK, we were expecting better Selections. not too many shops in the area. A bit far in terms of MTR stations going to attractions like Disney, Ocean Park. No HBO or other English movie channel. Buffet breakfast is ok. Floor access is secured by key card access. It was to far from the subway station and it was difficult to find. We had to wait about 15 min for breakfast on Sunday morning around 9:45. Connecting on the Wifi was fine with my phones but I couldn't do it with my laptop for some reason. Breakfast was good with a lot of selections. The chef went out of his way to make packed breakfast for us at the time of departure as we had an early morning train and could not have eaten breakfast at the hotel. Rooms were cramped. No room service. No attached restaurant.